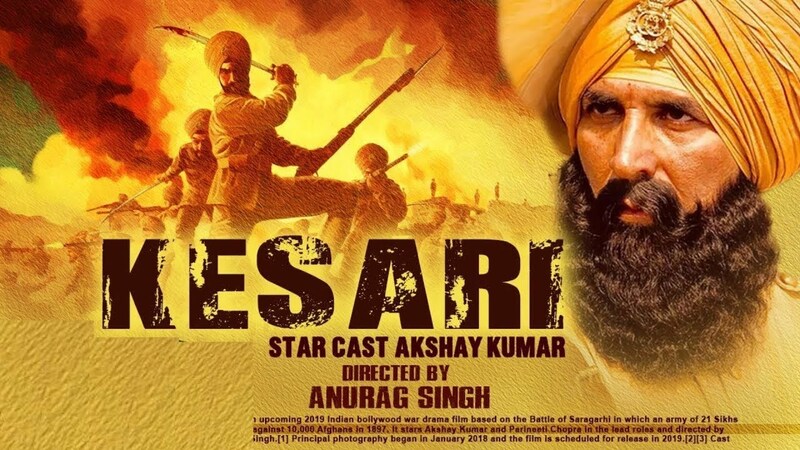 Kesari is the story of the epic Battle of Saragarhi fought between the 21 Jat Sikh soldiers of the 36th Sikhs Regiment of the British Indian Army and more than 10,000 Pashtun Orakzai tribesmen on 12 September 1897 in the Fort Saragarhi, North-West Frontier Province in British India. Havildar Ishar Singh (Akshay Kumar) is transferred to Fort Saragarhi for indiscipline in army where there are more undisciplined soldiers on punishment postings. Together they form a group of 21 cheeky but lovable rouges ready to take on the enemy that dares to look at their post. Havildar Ishar Singh being the most senior officer leads the group till his death in the Battle of Saragarhi. The 21 Sikh soldiers baffled the 10,000 Afghan fighters with their valor that is unpatrolled in the history. The poster has Akshay Kumar standing guard at the Fort Saragarhi. He’s seen flaunting his rifle with his left hand while the 20 soldiers are seen in the backdrop. Fort Saragarhi with a broken portion from where the invaders entered the fort is also visible behind the Sikh army. It is the epic battle fought between a handful of Sikh soldiers and a large number of invaders. Today both civilians and military personnel commemorate the Saragarhi Day on 12 September every year.